CZ-Ppt2Pdf Guide - It is a batch pdf converter that convert microsoft powerpoint PPT to PDF and can watch source file folder and convert new uploading ms powerpoint PPT to PDF files automatically. Power MP3 WAV Converter Guide - It directly converts audio format MP3, WAV, WMA, OGG from one format to another. PQ DVD to iPod Video Converter Guide - Converts DVD and Tivo2Go, DivX and other other popular video files to iPod Video, you can select entire DVD or chapters to rip. ACDSee 8 Photo Manager Guide - ACDSee 8 Photo Manager can browse, search, share, archive, organize or enhance your photo. 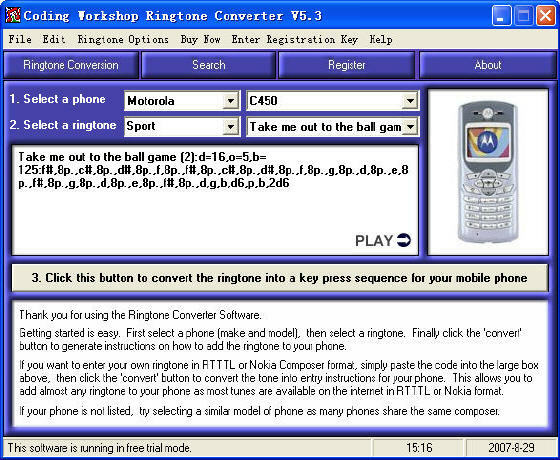 Coding Workshop Ringtone Converter Guide - You can add ringtones to most makes and models of phone with this software. Audio MP3 WAV WMA OGG Converter Guide - Convert Audio Files MP3, WAV, WMA, OGG from one format to another directly and quickly. ImTOO RM Converter Guide - ImTOO RM Converter is the RealMedia converter software which can convert Real Media RMVB to WMV, RMVB to AVI format, and etc. Image2PDF Guide - A file utility to combine image files into a pdf or multiple pdfs. You can convert a image file per pdf or many images into 1 pdf. WinXMedia CD MP3/WAV/WMA Converter Guide - It can rip audio CDs and convert almost all audio formats, such as MP3, WAV, WMA, MP2, Ogg Vorbis, AAC, APE(Monkey's Audio), VQF and so on. Alive Video Converter Guide - Alive Video Converter is the professional video converter that converts Convert AVI files to DVD, VCD, MPEG, or SVCD format. Amor AVI DivX to VCD SVCD DVD Converter Guide - It can convert AVI, DivX, XviD, MPEG, VOB, DAT, RM, and WMV to DVD, SVCD, and VCD format files that can be played on your VCD/DVD player. Amor Video Converter Guide - Amor Video Converter is a powerful batch Video converter supporting nearly all video format, including AVI, MPEG, RM/RMVB, ASF/WMV, DivX. Amor WMV to AVI MPEG VCD SVCD DVD Converter Guide - It's a powerful and simple to use application for WMV to AVI, WMV to MPEG, WMV to VCD, WMV to DVD, and WMV to SVCD video converting. Charm Real Converter Guide - It is easy to use and has a user-friendly interface. It can convert nearly all the audio files to RM files. And you can eidt the music information with this software. Mini_stream RM_MP3 Converter Guide - It is a Real Audio to MP3 converter, which makes it easy to convert the music in RM, RMVB, RMJ, RAM and RA formats into MP3 formats. MP3 RM Converter Guide - MP3 RM Converter supports batch conversion between MP3, WAV, WMA and OGG. And more important, MP3 RM Converter supports RM format. ABC Amber PDF2Image Converter Guide - ABC Amber PDF2Image Converter is an advanced tool to convert your PDF documents to any graphics file just like BMP, WMF, EMF, JPG, GIF, PNG, etc. ABC Amber PDF Converter Guide - Convert PDF to any document format (HTML, CHM, RTF, HLP, TXT, DOC, DBF, XML, CSV, XLS, MDB, DB, MCW, WPS, SAM, RFT, WS4, WS7, WRI, etc.) easily and quickly. Advanced PDF to JPG converter Guide - It is the simplest way to do so is to use our PDF to JPG converter that allows you convert PDF files to any image format you prefer: jpg, bmp, gif, png. Advanced Encode Decode Tools Guide - It includes Hi-Fi sound compression algorithms and a unique AC3 decoder. Easily converts between WMA, MP3, OGG and WAV format files with ID3 tags support. Apis RM to MP3 WAV Converter Guide - Apis RM to MP3 Wav Converter lets you easily to convert Real Audio files to MP3 or WAV files, and Extract the Audio from the Real Video files. ASX to MP3 Converter Guide - With this program you just need 2 steps to convert WMA, WMV, ASF, ASX and WVX files to MP3 from your computer or on the internet. Audio Converter Guide - Audio Converter quickly and easily converts audio files and CD-audio tracks directly to WMA, MP3, AIFF, Ogg, and WAV formats. avone all to mp3 converter Guide - It can convert RM, RAM, RMVB, AVI, MPEG, ASF, WMA, WAV to MP3 and WAV. It also can split your favorite music from movie and save as mp3 and wave file. Cool All Video/Audio to MP3/WAV Converter Guide - A powerful video/audio batch converter that can convert any kind of Windows media file to MP3 or WAV. CZ-Doc2Pdf Guide - CZ-Doc2Pdf is a batch PDF Creator that convert word to PDF, DOC to PDF, html to PDF, text to PDF and RTF to PDF, and can watch source file folder. ABC Amber Excel Converter Guide - It helps you convert your XLS (MS Excel) files to any format you wish (DBF, CSV, XML, PDF, HTML, CHM, RTF, HLP, DOC, and many more) easily and quickly. Blaze ImgConvert Guide - Blaze ImgConvert is an advanced batch image and graphics converter software application that supports over 140 formats and an entire arsenal of options and features. ReaConverter Guide - ReaConverter conversion tool lets you convert your files from different formats and folders to the one, specify the output file type, names, size. Ease Midi Converter Guide - Convert MIDI to MP3, WAV, OGG, WMA, AAC, FLAC, and APE in batch. It copies the audio digitally, enabling you to make perfect copies of the original ones. Cucusoft DVD Ripper Guide - It can backup your favorite DVD movie into almost all popular video formats such as VCD, SVCD, DivX, MPEG, AVI etc of your computer. Windows HLP To RTF Guide - This software help you to make a specification of an application from the *.hlp files, and split the output into several RTF files. Universal Document Converter Guide - Convert Word documents, Adobe PDF files, PowerPoint presentations, AutoCAD drawings and more documents to PDF, TIFF, JPEG, GIF, PNG, BMP, PCX or DCX etc. Image to PDF Command Line Tool Guide - Convert images (JPG, TIF, PNG, GIF, BMP, WMF, EMF, PCX and TGA) into PDF from command line/batch file, with parameters/scripts. Image to PDF Desktop Application Guide - Convert images (JPG, TIF, PNG, GIF, BMP, WMF, EMF, PCX and TGA) to PDF through an intuitive Windows interface sectioned into tabs. ABC Amber PocoMail Converter Guide - Backup and archive your important emails, newsletters, newsgroups mails, converting emails from PocoMail to any format you wish. Windows HLP To RTF Guide - Convert Windows Help files (*.hlp) to manual-quality Rtf format documents, and make a specification of an application from the *.hlp files.